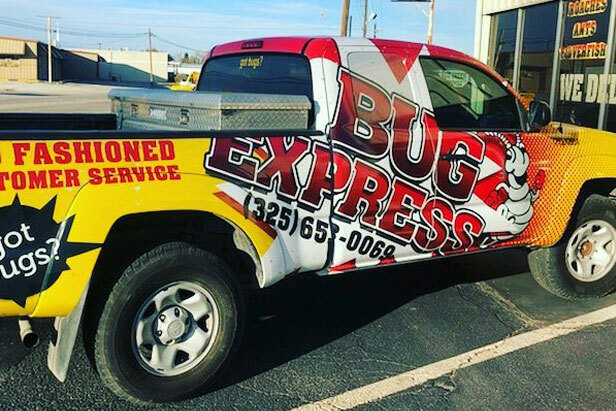 Bug Express Pest Control was established with the vision of becoming a small, West Texas family-owned business. We grew one customer at a time, one friend at a time, and good referral upon good referral. We have become the area leader in termite home and commercial inspections. From that position, Bug Express has been able to have the strength to launch other valuable services such as termite treatments, odor control, commercial and residential pest control, and lawn and weedcontrol. We have even purchased football team!! From the most humble beginnings, we continue to grow as we diligently meet the needs of our customers. Bug Express Pest Control offers a variety of full service capabilities. We provide pest management services for every type of need including insect, rodent, stored product pest, bird, termite, mesquito lawn care, weed control and other general pest control services. We, also, boast the most trained and experienced technicians in West Texas. The key to success in any pest management program is directly dependent on the quality of people who are performing the service. Bug Express continually trains and educates our technicians with the most advanced pest control products and techniques available. Keen attention to the quality of technicians we hire has enabled us to keep some of the best pest control people in the business. So give us a call or come by and see us. We would be happy and grateful for your business. We appreciate the support in the past and look forward to serving you in the future. Our Professional Experience will help you get Bugs out! Bug Express Pest Control has over 40 years of combined knowledge and experience in pest management. We believe in providing unmatched service with uniformed technicians and full service capabilities. We offer complete, quality assured programs for manufacturing, food processing and distribution, supermarkets, hotel/motels, food service/restaurants, property management companies and their apartment complexes, healthcare facilities and various other retail and commercial properties.